Providing you the best range of sliding gate automation 1006 dc and commercial purpose usage of gate automation 1000kg with effective & timely delivery. Usage/Application Suitable for gate upto 30mtr opening. Installation Type With new wireless keypad the gate only operates with password set by you(optional). (MADE IN ITALY) LIVFUTURE :- Model: SDC 1010 Remote sliding gate Operates on Remote/switch/ or almost any other entry management system.With flashing lamp for notification of gate in operation, Auto closing gate delay time adjustable, Electronic soft start and stop, Photocell - automatic return for resistance during closing gate. (Optional), Manual opening of the gates in the event of power failure, Battery Backup (Optional),LivFuture Sliding gate automation kit. 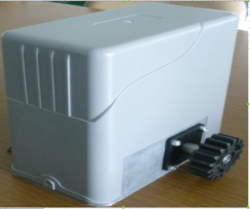 SDC 1000 with high quality surface motors for single gate,This kit will operate steel or wooden gates and can be fitted between or behind (or even in front of) the gate posts, Suitable for up to a 12mtr opening. Looking for Intensive use Gate Automation ?